Parrett Mountain certainly represents one of the gateways to Willamette Valley wine country. 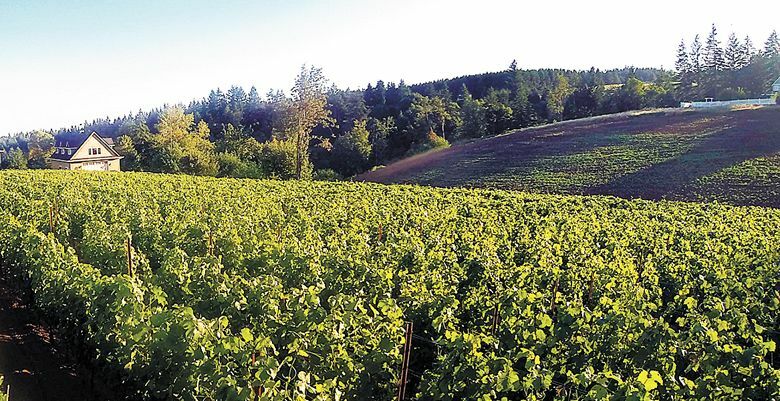 With its convenient location between Sherwood and Newberg, close proximity to Portland and expanding number of small-production, family-owned wineries, this particular area in the Chehalem Mountains AVA is coming into its own. While some of these wineries have been there for a while, others are new, boasting exceptional wines, impressive views and personalized service. Just like anything worthwhile, Parrett Mountain won’t stay a hidden gem for long. Nestled deep in the forest of Parrett Mountain sits Parrett Mountain Cellars. 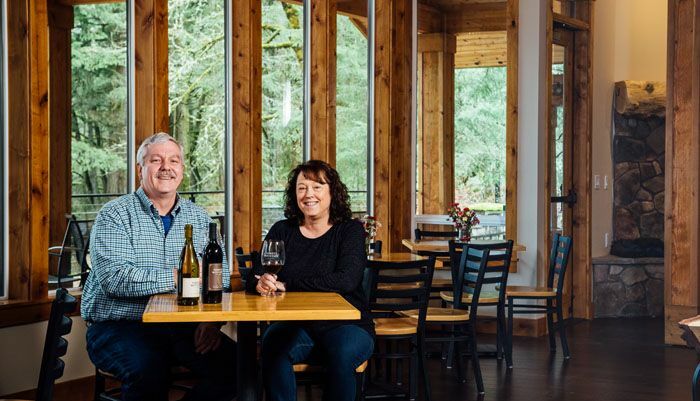 Though the tasting room just opened in September, owners Marlene and Dennis Grant have been making wine for seven years. They purchased the 11-acre parcel in 1992, choosing the site because of their love for Newberg and the rustic feel of the location. Visitors can enjoy a lineup of stellar wines, either from inside the lodge or on the deck. With fireplaces and blankets to keep guests warm in the cooler months. The beautiful north-facing views show Mount St. Helens and Mount Rainier, yet the northern exposure doesn’t provide enough sun for planting vines. 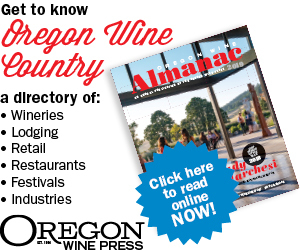 With only an acre of Pinot Noir was planted five years ago, they purchase the majority of fruit for their wines; Pinot Noir, Sauvignon Blanc, Pinot Gris and Pinot Blanc hail from the Willamette Valley while their big reds — Barbera, Tempranillo, Baco Noir, Petite Sirah, Malbec, Cabernet Sauvignon, Zinfandel, Cab Franc, Sangiovese — are sourced mostly from the Umpqua Valley and Eastern Washington. The tasting room showcases impressive wood details sourced directly from their own land. Having cut down a huge cedar and some fir trees, the Grants were able to mill the wood locally and re-purpose it in a variety of ways. Rough-sawn board and bat cedar is now the siding on the outside of the building; the posts and trusses are all wrapped with the cedar, and the centerpiece in the middle of the tasting room — the one that gives the space it’s truly rustic, feel — is the top 28 feet of the felled cedar. Additionally, the bars are made from slabs of cedar, maple and fir from the site. 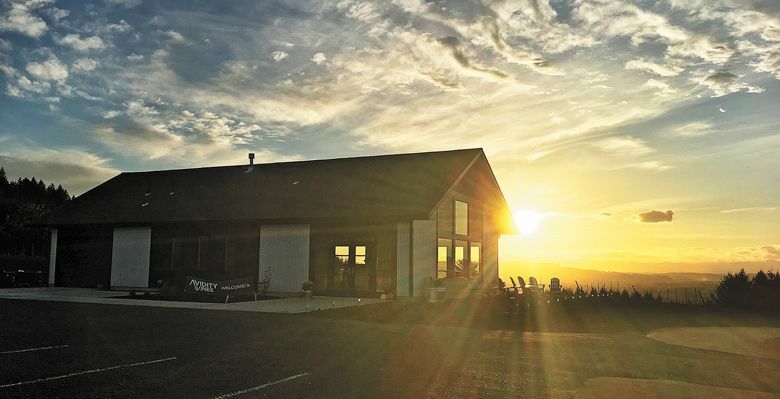 Rich and Julie Schoenert moved from Sherwood to their 20-acre Parrett Mountain property intent on planting a vineyard and opening an accompanying winery and tasting room; the couple accomplished their goal with the opening of Avidity Wines in October of 2018. They planted five acres of Pinot Noir last spring with plans to establish a few more. Avidity Wine’s first harvest will be in 2021; in the meantime, the Schoenerts source Pinot Noir, Pinot Blanc and Chardonnay from several Willamette Valley vineyards, as well as Merlot, Cabernet Sauvignon, Cabernet Franc and Syrah from the Columbia Valley. The couple has definitely succeeded in creating a fun spot. With rock concert posters on the walls, lively music playing, an 18-foot roll-up glass garage door and a cozy fireplace with comfy couches. There is plenty of outdoor space with picnic tables and Adirondack chairs to enjoy the 180-degree views. The expansive lawn is perfect for picnics on a blanket, so visitors can easily wile away the day here. Beckham Estate first opened for tasting in 2011. Owners Annedria and Andrew Beckham initially purchased a home on eight acres to build an art studio but became distracted planting grapes. They established their first vineyard in 2005, and then purchased an additional 20 acres in 2013. The estate now features a welcoming tasting room set in what feels like a lush oasis, surrounded by productive gardens. The Beckhams are anything but traditional. 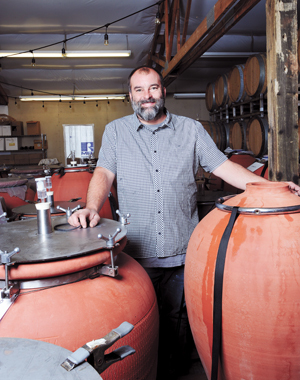 Andrew handcrafts ancient-inspired clay vessels, A.D. Beckham Amphorae, for aging wine. They’re also experimenting growing different varieties. For example, in addition to their 6.5 acres of Pinot Noir, they are cultivating Riesling, Trousseau Noir, Sauvignon Blanc, Aligoté and a test block with some Italian varietals. To find out the details, visit the charming pint-sized tasting room that also serves as a gallery for Andrew’s fine ceramics. The public tasting room for Rallison Cellars is actually located in Old Towne Sherwood, but the vineyards are located on Parrett Mountain with views of the Cascades, Mount Hood and Mount Adams. Jared Rallison planted three acres of Pinot Noir and is in the initial phase of planting five more acres of Pinot, among other varieties. Rallison sources the majority of their fruit from vineyards located in the Willamette Valley, Southern Oregon and Eastern Washington. In addition to Pinot Noir, customers can enjoy Viognier, Albariño, Sauvignon Blanc, Tempranillo, Malbec and Zinfandel. In addition to the new vineyard blocks, Rallison is also building a new facility two miles from the old winery; it will be twice the size, with a covered crush pad and more parking to allow club events and tastings by appointment. At Archer Vineyard, visitors can enjoy tasting distinctive Pinot Noir, Pinot Gris and rosé while viewing vines just feet from the tasting room. Guests can relax at the bar, in the sun-filled lounge or on the deck, where they can take in the 180-degree views of surrounding wine country and the Coast Range. 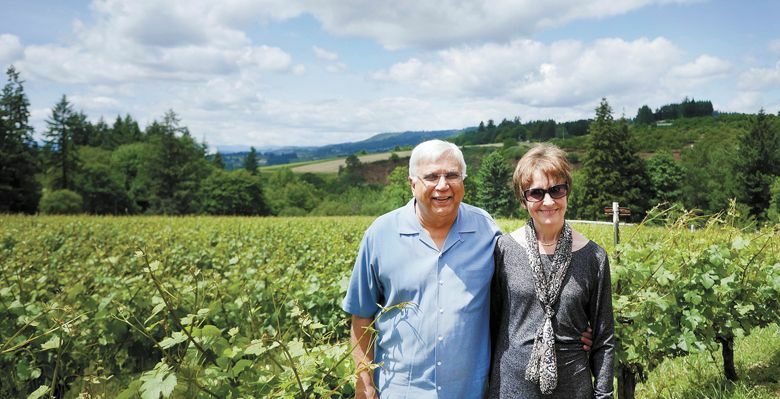 The 6.5-acre vineyard, situated on the southwest-facing slope of Parrett Mountain, was planted by Don and Grace Archer in 1990, when the Oregon wine industry was still very much up-and-coming. In 2005, Saj and Pauline Jivanjee purchased the property and subsequently created a 10,000-square-foot winery and tasting room. Archer is dedicated to enriching the local area with quality wines and a place for the community to enjoy.